The launch of our Believe editorial series in Mumbai saw the sharing of wisdom and empowering tools by speakers Arianna Huffington, Sonam K Ahuja, Amish and Ashwiny Iyer Tiwari. It was an evening that reinforced the power of self-belief in dealing with the challenges of an increasingly complex world. The launch of Thrive Global India’s Believe series manifested the editorial intention to share inspiring stories of people and situations that broke through the bleakness and emerged stronger, better and happier. The launch event included two discussions: The first had best-selling author Amish talk about Indian wisdom and what it tells us about dreaming and believing with award-winning filmmaker Ashwiny Iyer Tiwari in a session moderated by author Kiran Manral. 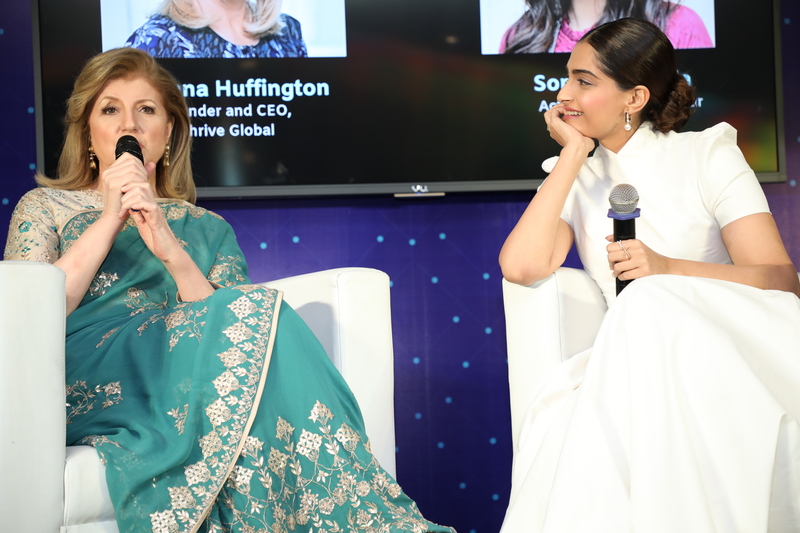 The second saw Thrive Global founder and CEO Arianna Huffington in a honest conversation with actor-entrepreneur Sonam K Ahuja on rejection and the power of self-belief in women. The evening provided food for thought and some simple yet effective tools for thriving: here are a few that particularly resonated. 1. Don’t sweat the small stuff:“The only way to live is to not think about it too much,” said Sonam Kapoor Ahuja when asked how she stays equanimous despite the numerous ups and downs of an actor’s life. 2. True liberation is in achieving balance: In Amish’s words, a successful life is one with a balance in dharma (law), artha (wealth/power/fame), kama (not just eroticism but also the arts, music and dance), and moksha (finding liberation from the cycle of life). 3. Believe in your ability to see you through: Believe in yourself, urged Sonam. “You need to really centre yourself and be in the moment and say, I’m amazing, I can do this and I’m the best version of myself.” As an artist, there is always a fear of judgement, she said. “Everything you put out there has to be validated and the only way to navigate it is by having an incredible amount of self-belief.” Huffington remembered Rumi and recited her favourite quote by him, “Live life as though everything is rigged in your favour,” to illustrate how she overcame the hurdles in her life. 7. Use the happiness tools: Sonam shared simple tricks she practises to stay centred such as putting away the gadgets before bedtime, and calming techniques of reciting the Gayatri mantra to lend more positivity to her life.